I was invited to Twerk for your Beer by Carrie Srebro, a friend of mine from Burn Boot Camp. It’s held in a private room on the second floor of a local brewery, Cabarrus Brewing Company, was $6 and included a ticket for a free beverage (beer or kombucha). I’d missed taking Zumba classes at the Y since I joined Burn almost a year ago, so I jumped at this opportunity. Twerk for your Beer is hosted by a company called Work For Your Beer. They hold boot camp classes, yoga and twerk classes across the country. Carrie had attended a few at Charlotte breweries. She loved the instructor, Kara Vasseur, (spoiler alert – I did too) and recruited our whole crew to join her the next week. Because it was a dance workout, I assumed the “twerk” was just a play on words; not something we’d actually do. OH how I was wrong. About 10 women from Burn attended the class that night, along with 5-7 other women that we did not know. Our instructor started by saying, “This is your hour. If you are having trouble following along, or don’t like what I’m doing, do your own thing. Just keep moving!” We jumped right into the full body workout. I made sure to burn extra calories by singing along to the songs that I knew (sorry for those around me. Sorry, not sorry.). There was a ton of twerking, gyrating and squats. It’s important to know that this particular class was the day after leg day. 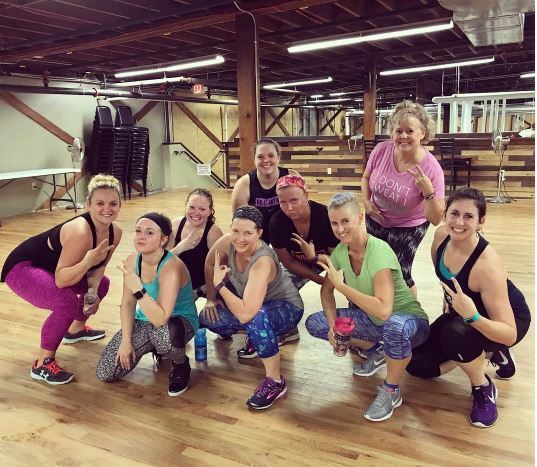 All the Burn women groaned loudly every single squat as we worked the lactic acid out of our legs. The music was fun and upbeat with a good mix of old and new. I’ve added some of these songs to my “Get Hype” playlist and perform whatever moves I can remember in my car and around my house. My favorite part of class was during Katy Perry’s song “Swish Swish”, Melissa Bliss, resident HarrisBURN unicorn, decided to follow the instructor’s advice to “do your own thing” and danced in YouTube star fashion. It’s easy to get self-conscious during these types of classes. You think everyone is looking at you, it’s sometimes hard to follow along with the movements (I get my feet mixed up and move the wrong way), but it’s important to have fun with it and remember that it’s a safe space. Everyone feels the same way. As she said, just keep moving.